Who needs Harry Potter? The boy wizard was the hero of one of the most popular book and film series of all-time, but with Fantastic Beasts and Where to Find Them, it’s undeniable that the clear star is screenwriter and Harry Potter author J.K. Rowling. While magizoologist Newt Scamander (Eddie Redmayne) is ostensibly the protagonist of Fantastic Beasts, it’s clear that rather than take us through another hero’s journey arc, Rowling wants to take her audience to a different era with timely conflicts. Director David Yates helps provide a cohesive vision, and Rowling brings us an endearing cast of characters that we’ll want to follow on new adventures. In Europe in 1926, the mysterious dark wizard Gellert Grindelwald is wreaking havoc, but the British Newt Scamander has cheerily made his way to New York City where he’s doing research for his new book, Fantastic Beasts and Where to Find Them (a text Harry Potter would eventually get in his first year at Hogwarts). However, a suitcase mix-up with “No-Maj” (which is what Americans call Muggles) Jacob Kowalski (Dan Fogler) leads to several beasts escaping and running wild in the city. 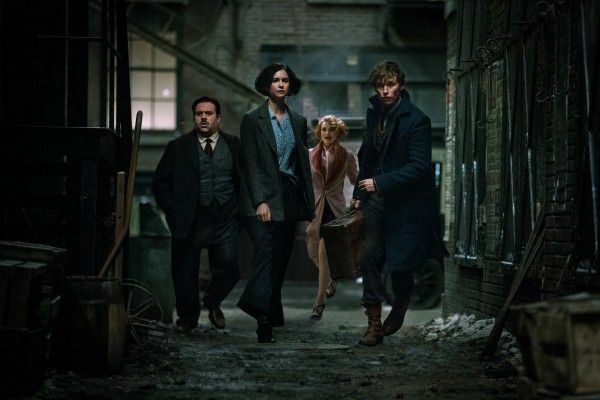 Newt and Jacob team to track the beasts down while ex-auror Tina Goldstein (Katherine Waterston) thinks that apprehending Newt and his beasts is her ticket back into the good graces of the Magical Congress of the United States (MACUSA). 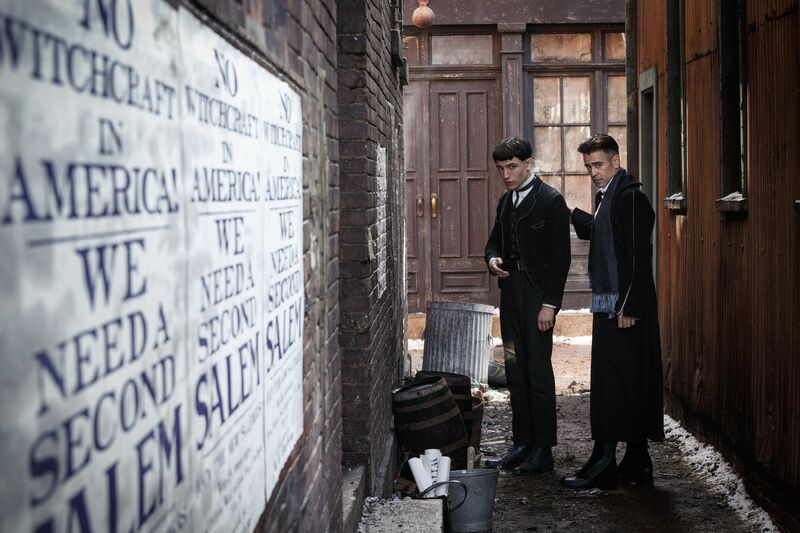 Meanwhile, Credence (Ezra Miller), a troubled young man, is being goaded by head auror Percival Graves (Colin Farrell) to help track down a young wizard who may be unleashing a dark magical force upon the city. Even though the main plot of Fantastic Beasts is about Newt trying to track down and reclaim his creatures, there are really four plotlines running through the movie. There’s Newt and his monsters, Grindelwald (which looks like the storyline that will run through all five Fantastic Beasts movies), Credence, and Tina. Rowling does an admirable job of weaving them altogether, and while the individual characters are charming, their relationships feel a bit undercooked because so much time is dedicated to jumping between plotlines and re-capturing beasts. For example, Rowling tries building in romances between Newt and Tina and another between Jacob and Tina’s sister Queenie (Alison Sudol), and while I can believe that these are all characters who like each other, we’re meant to believe that they’re in love by the end, and that’s a bit of a stretch. Additionally, while Graves makes for a solid antagonist, keeping his motives shrouded in mystery for most of the film makes him come off as evil for the sake of being evil. He’s also in the tradition of villains that I had hoped Rowling outgrew after the first four Harry Potter books (to say anything more would be to spoil what makes Graves tick). Oddly, the best relationship in the movie isn’t the romances but the friendship that blossoms between Newt and Jacob. While we don’t really need an audience surrogate anymore after eight Harry Potter movies and probably know the world as well as the magical characters, there are always new things to discover, and we get to share in Jacob’s wonder in a way we couldn’t with Harry. For Harry, every new discovery was a thing he was a part of. For Jacob, we share in his wonder at all of Newt’s magical creatures, but it’s bittersweet because we’re also outsiders. We’re grateful to be along for the ride, but we know it’s going to have to end. It helps that Fogler is wholly endearing and rather than play up the physical comedy, he leans into Jacob’s amazement and wonder. He’s also a vital character in the larger thematic conflict that Rowling is exploring. For Jacob, wizards and witches aren’t to be feared. For all of the strange creatures that Newt has in his case, Jacob doesn’t look at them with revulsion and fear. He may be shocked, but he’s not disgusted or repulsed. The film contrasts this with the crusade of the Second Salemers, No-Majs who are looking to expose the wizarding population. Credence, who’s the abused adopted son of the Second Salemers’ leader (Samantha Morton), is painted as a pitiable figure who desperately wants to be part of a magical world that his mother tells him is wicked. For every homosexual viewer who sees this movie, I suspect they’ll connect deeply with the anguish and torment Miller brings to his powerful performance. These kinds of themes—acceptance, social divisions, and bigotry—are as crucial to Rowling’s wizarding world as wands, spells, and apparating. That’s what makes her stories special. She didn’t just come up with a fun tale where people with magical powers live among us. The social commentary has always been a part of her writing, and it’s in the foundation for Fantastic Beasts. While it remains to be seen how this all factors in with Grindelwald (who, as we learning in the Harry Potter books, will eventually be defeated by Dumbledore in 1945), Rowling has set up a rich, interesting universe with her feature screenwriting debut. The one drawback is that it looks like, as of right now, Fantastic Beasts will be a franchise without a strong central protagonist like Harry Potter. There’s nothing particularly wrong with Newt, and I’m glad that he’s not a Harry-rehash. He’s kind of awkward and seems far more comfortable with his creatures than he does with other people. However, because Rowling is trying to cover so much ground in introducing this new era of the wizarding world and the many plotlines contained therein, Newt gets a bit of a short shrift. It’s why we get glimpses of a doomed romance he had with another wizard, but there’s not enough time to build a strong relationship with Tina. There’s nothing bad about Redmayne’s performance, and I look forward to seeing more of him, but I worry that in her haste to explore all the corners of the wizarding world, Rowling may lose sight of the characters who inhabit it. But that hasn’t happened yet, and Rowling has more than earned our trust with her wonderful stories. It’s possible (and I’d say likely) that she will build on the foundation that Fantastic Beasts offers, and while it does raise questions about how Newt factors in when it appears that Rowling is keeping her eye on the looming conflict between Dumbledore and Grindelwald, for now it’s just a delight to return to the world she gifted us with Harry Potter and see it in a whole new light with Fantastic Beasts.